After talking about the best running backs and linebackers available last week, we move into the trenches in our positional draft rankings. For this edition, I combined offensive guards and centers because the necessary skill-sets are very similar and many of these prospects played both positions during their collegiate careers. While their value might differ depending on offensive scheme, I like to evaluate them as one group. There are definitely no generational-type prospects like Quenton Nelson on this list, who I had as my number two overall player, but this group has about a dozen quality names. As the league moves more towards wide-open offenses that throw the ball out of shotgun and try to get it out quickly on a multitude of screens, mobility and pass-protecting are becoming more important, but there is still a lot of value of what interior offensive linemen can do for you in the run game. Obviously each team will evaluate these prospects according to their scheme, but for the purpose of this list, I am looking for complete players, who will help my offense move the ball. A former four-star recruit from Iowa, Pierschbacher started 46 games for the Crimson Tide and only a high ankle sprain could keep him out of three contests in 2017. After a redshirt year he immediately stepped into the left guard spot, earning Freshman All-SEC honors. He went on to start all games he was available for the next two years splitting time between both guard spots. 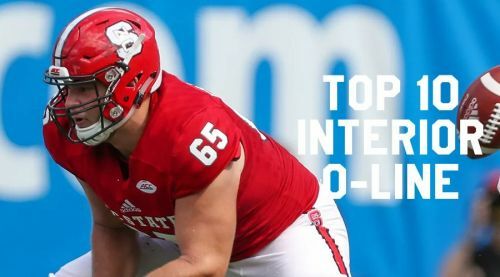 In his senior year however he moved to center and excelled in that role as well, earning second-team All-American accolades on his way to a fourth straight National Championship game appearance,. Pierschbacher has a super wide chest and massive thighs. He will run his feet through the defender until the whistle blows and keeps his hands stuck to the target. Pierschbacher twists and turns big men in the run game, making it hard for them to gain vision on what is going on in the backfield and he doesn’t let go off blocks. He uses a good drop-step to reach defensive linemen and continues to get his hips around to shield defenders from the ball-carrier as the play develops. He quickly gets into his pulls and was asked to skip-pull, kick out end-men and seal linebackers. As a pass-protector he steps and shoots quickly to gain control of the guy in front of him and has superglue-type grip on opposing rushers. Pierschbacher is hard to get around due to his broad frame, but he also keeps good posture and has the length to lock out rushers, as well as keeping a very wide base to stay balanced. He is a technically sound pass protector who jumps on the guy in front of him and usually gains control of the him from the get-go. He allowed only four total pressures on 422 pass-blocking snaps last season. The high IQ guy points out blitzers, keeps active eyes and rarely misses looping defenders on twists. However, Pierschbacher looks a little heavy-legged when trying to get on the move and is vulnerable to push-pull moves when he shifts his weight too far forward. At the Senior Bowl he got run over on the first rep of one-on-ones by Texas A&M’s Daylon Mack and rather skipped backwards on the second one as well. He looked pretty solid after that but he is a natural rock to negate powerful guys on the interior. I also think he needs to do a better job re-positioning his hands when his man decides to spin the other way. Pierschbacher Won’t show up on any highlight tapes with monster blocks in space, but he rarely gets out of position and simply gets the job done. He was a great communicator for that Alabama O-line and got everybody into position. Pierschbacher has the intelligence and versatility to play probably anywhere on a team’s front, although guard is his natural fit in my opinion. There are some athletic limitations, but nothing to keep him out of the pros. This kid was an excellent four-year contributor on the Sooners offensive line. Samia started nine games at right tackle as a freshman and in the season-opener the following year before moving inside and earning honorable mention All-Big XII by league coaches. He was a second-team all-conference performer these last two seasons and one of three players to receive honors for the conference’s top offensive lineman of the year. The 47-game starter is a technically sound run-blocker. He has a good initial stab to gain leverage on the defender in front of him and he takes his initial steps the same way even if there is no obvious responsibility, before climbing to the second level. Samia is very active on zone schemes, where he is looking to tag onto nose tackles from the side and lets the linebacker come up before putting hands on him. I like the way he turns bodies at the line and continues to drive them off the spot or even put hands on a linebacker trying to scrape over the tape. At 6’5”, around 300 pounds Samia is an outstanding athlete, which shows in his mobility to pull out in front. He was used to kick out the play-side defensive end and he does a nice job turning that guy’s pads towards the opposite end-zone after initiating contact, to open up big holes. Overall I really like the nastiness Samia and all those guys on the Oklahoma O-line play within pass protection he is looking to deliver the blow and then settles down. Samia keeps active feet when he doesn’t have a direct assignment and is looking to help out one of his teammates. He was pulled around quite a bit to sell play-action. He did not give up a single sack in 2016 or 2018. During the Senior Bowl game he gave Boston College’s Zach Allen a little shove after he committed a roughing the passer penalty on the quarterback and I like that attitude to protect his guy. Samia has a little wind-of of his arms at times, which makes it easier for defenders to knock them away and make this whiff. He struggles with long, athletic D-lineman, who can take advantage of his aggressive pass sets by grabbing the back of his pads and arm-overing him. He is also a little late at sliding back over against twists. If there is one position where I would take a gritty, technically sound player over one that is more athletic and talented one it is offensive guard. That is why I would definitely select teammate Ben Powers over Samia, who many love because of the type of athlete he is. I think he could work out in the league, but he might have to move to center or at least add a couple of pounds through the weight room. With Quenton Nelson and Mike McGlinchey stealing the limelight and both being top ten prospects last April, nobody really looked at the third star along that line a couple of years. Alex Bars comes from a football background with his dad being a former Irish linebacker and his two brothers playing on either side of the line for separate Big Ten schools. After a redshirt year Bars saw some game action as a freshman but had it cut short by ankle surgery. He took over at right tackle once McGlinchey was asked to switch to the left side although he went back to his natural position at right guard in 2018. After logging 30 consecutive start, Bars was lost with a torn ACL and MCL versus Stanford last year. Bars has a fridge-like build with broad shoulders and a wide torso. He typically plays with excellent leverage and leg-drive, Bars uproots defense off their spot and torques bodies at the line of scrimmage to open up paths for his running back. He continuously bringing his hips around, while having the mobility to pull out in front and locking onto targets at the second level or kick out end-men, where he brings some thump at initial contact. He is also an excellent power-blocker, coming around in a tight line and walling of linebackers in space, plus when there is no immediate threat he will find somebody to push around. Bars frees himself up to climb on combo-blocks by staying tight to his teammate’s hip and getting excellent angular momentum on that primary defender to set up his buddy. He does a nice job shielding guys away from the action and doesn’t try to do anything unnecessary, while hooking D-linemen in the zone run game to take away penetration. As a pass-protector Bars delivers an upward thrust to take away the initial momentum of big defensive tackles across from him and sticky hands to hold onto those guys. He has the lateral quickness to square up blitzers and pushes guys into the pile when they get a step on him to the inside. The 2018 team captain is alert for twists and invites his man with a good punch. He utilizes appropriate cut-blocks on quick passes and in space to sweep guys off their feet in space. However, Bars plays with his head too far in front and fails to latch onto targets if they quickly knocks his hands off. He isn’t a natural knee-bender and can get exposed for that by savvy defenders. He gets stood up by some of the more powerful D-linemen and he has some troubles staying late on plays when his opponent pulls him by his pads and he falls forward, while also being caught in the wind-up phase at times and can be eluded by well-school defenders. Although his knee will have to check out fine and the lower body flexibility definitely needs work, I think Bars could be a nice day-three pickup. He has a good understanding for blocking angles and linebacker’s movements, quality experience at guard and tackle and he was part of that 2017 offensive line that earned the Joe Moore trophy for the best group in college football. This kid came to Raleigh as an excellent high school tight-end. He redshirted his first year at campus and after an injury he moved to guard, where he played as a reserve in 11 games. Bradbury would go on to start 26 straight games at left guard and earned honorable mention All-ACC accolades as well as the team’s award for their unsung hero in 2017. 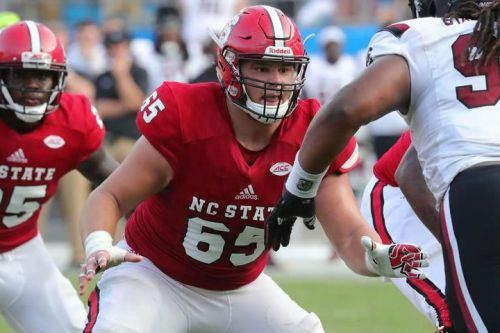 The national recognition however came as a senior, when Bradbury was a first-team All-ACC member and was the won the Rimington Award trophy for best center in the nation. That athleticism catching passes in high school shows in Bradbury’s mobility to reach defensive tackles, climb to the second level and pull around. His snap-to-step quickness is off the charts and Bradbury displays excellent leg-drive on zone schemes, where he almost forces the guy next to him to get moving a little more. The ground he covers on outside zone schemes is incredible and he ends up reaching 3-techs in the process at times. Bradbury runs himself into to position to climb, is smooth at moving up to the linebackers and plasters onto those blocks at that second level. He continues to turn his hips and drives to give the running back a clear path behind his back. While Bradbury has the reputation of being a finesse blocker due to his agility, I have even seen him land on top Clemson’s Christian Wilkins. In pass pro he immediately gets his eyes up and his feet ready. Bradbury might need to add some sand to his pants, but he has the lateral agility to stay in front of guys and that also allow him to get in the face of linebackers. When he can help out from the side on a rusher, he really helps negate some great defensive linemen in the ACC. Bradbury can easily handle protecting one gap and he has such active, quick feet that he moves right along with spin- and other counter-moves. He keeps head on a swivel and is very alert for any types of stunts and blitzes, while showing the lateral agility to cover some of the miscues of the guards next to him. At just over 300 pounds, Bradbury is slightly undersized and has some anchor issues against the really powerful big guys. He got put on his back on the first one-on-one pass rush rep of the Senior Bowl week, even though he continued to fight and won the majority of his battles going forward. Bradbury has to give up some ground at times to gain it back when left one-on-one in the zone game, is not the strongest pure drive-blocker on gap-schemes and has to lean quite a bite when really trying to create movement that way. He will probably better suited to play in a sliding protection offense, where he is not left on an island. With hips like Shakira, outstanding intelligence, reactive quickness and being technically sound with footwork and hand-placement make, Bradbury is my number one center and overall interior offensive prospect. I expect him to be a Pro Bowl level starter for a decade plus and he will open up the offensive play-calling to running schemes most teams can’t execute. Bradbury only solidified that at the combine, when he ran a 4.92 in the 40, put up 34 reps on the bench press, recorded the fastest three-cone drill of O-linemen and looked incredibly agile in on-field drills.